Powerful forces are reshaping the retail banking and payments industry. As a result, full-service banks are challenged by agile, “digital first” competitors who aggressively pursue customers by addressing their needs in new and distinct ways. To compete, banks need to radically transform themselves and innovate for the future. 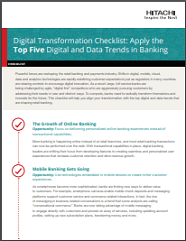 This checklist will help you align your digital transformation with the top digital and data trends that are shaping retail banking.